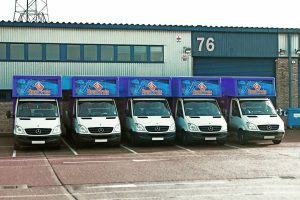 East London’s fastest growing moving company, Top Removals, has officially announced a desire to expand its already impressive fleet, responding to an increase in demand for more moves and for bigger moves. The company is known well in London, delivering removal solutions for domestic and commercial customers in the region. With business through the roof and more demand for bigger moves, they say expanding their fleet is a natural response and that they’re currently looking for a new vehicle. A larger fleet with a bigger moving truck will provide a lot of benefits for Top Removals, allowing them to improve upon and roll out their services. Ultimately, for Top Removals it all comes down to giving the customer more convenience and move options. “Our main goal is to better the services that we currently provide. We’ve got to where we are today by always holding ourselves to the highest standards and striving for excellence. By adding a large 18 tonne vehicle to our fleet we’ll be taking a couple of steps forward in that regard, cementing our position as the number one moving team in the area. Top Removals is a leader in the removal industry. They’re located in East London and have experience in abundance, working with individuals, businesses, and organizations to help them to move their prized possessions in rapid time without a hiccup. They provide professional packing, storage and removal solutions amongst others. For quotes contact Top Removals on 020 7205 2525 or info@topremovals.co.uk.